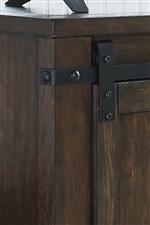 Casual style with industrial style barn door hardware creates a versatile modern rustic look. Adjustable shelving offer plentiful storage to your choice of TV stand, available in three size options. Browse other items in the Budmore collection from Nashco Furniture - Nashville in the Nashville, Franklin, Brentwood, Clarksville, Green Hills, Davidson County, Williamson County, Tennessee area.